Lately, I have been working out more and this, in turn, motivates me to make healthier choices when it comes to mealtimes. One of my healthier choices has been including plenty of filling salads on our menu. I feel lucky my husband and kids love salads too, so there is no complaining if I serve a hearty salad for dinner. I often make this Classic Ranch Steak Salad that comes together in minutes and makes the perfect grilled lunch or dinner. The ranch dressing is my own homemade recipe too, so it all combines for a salad the whole family loves. 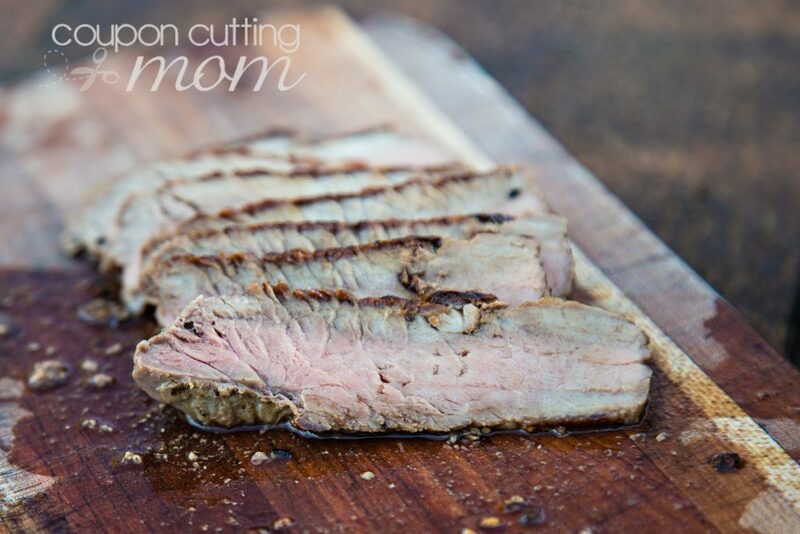 I’m excited to partner with Moyer Beef to bring you this deliciously healthy steak salad recipe. 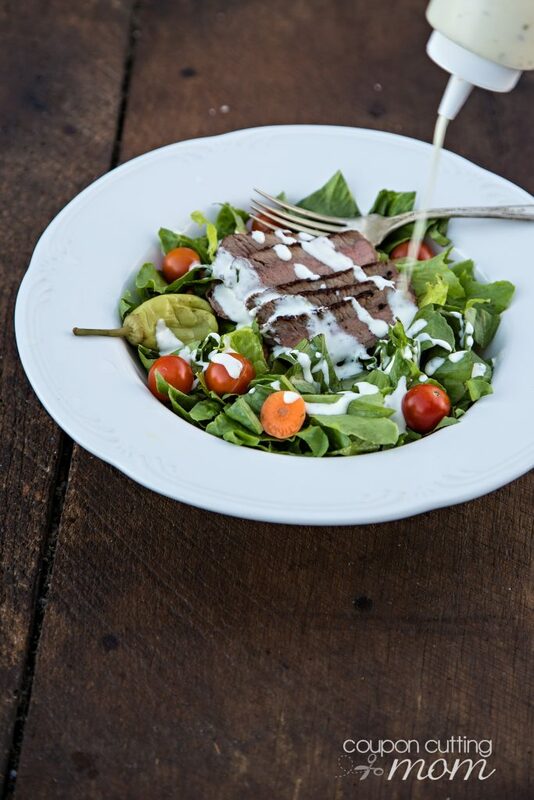 My Classic Ranch Steak Salad features a tender sirloin grilled to perfection over a bed of fresh leafy greens. I load the salad up with plenty of fresh veggies such as tomatoes, carrots, onions, peppercorns. Really you can add any veggie your heart desires! Adding steak to salad is a perfect way to accomplish several healthy habits at the same time. I get some protein in, yet have portion control. Plus, I can stretch a steak or two to feed my entire family by slicing it for my salad topping. I like to keep my steak easy by seasoning my beef with simple sea salt and cracked black pepper, for a classic steak flavor. This method is great for busy weeknights when you don’t have time to think about marinades. But, if you have time, you can punch up the flavor of a sirloin steak by marinating in Cajun spices for a “blackened” touch before searing on the grill. Cajun and ranch dressing are a perfect spicy versus cool flavor contrast! Whichever way you choose to season your sirloin, cook it to a medium-well, and then remove from the grill, let rest for five minutes, and slice thinly across the grain. Layer several slices onto each bed of lettuce. Then drizzle with a clean-eating homemade creamy ranch dressing for that burst of cool flavor! My homemade ranch salad dressing tastes better than anything store bought and only takes minutes to make! I like to double or triple this recipe as it keeps well in the refrigerator for at least a week. Plenty of garlic, dill and other spices give this dressing the perfect flavor. The tang of lemon juice adds the perfect zesty note to the creamy dressing. Plus, this dressing is a perfect consistency – just thin enough to pour smoothly without being too watered down. 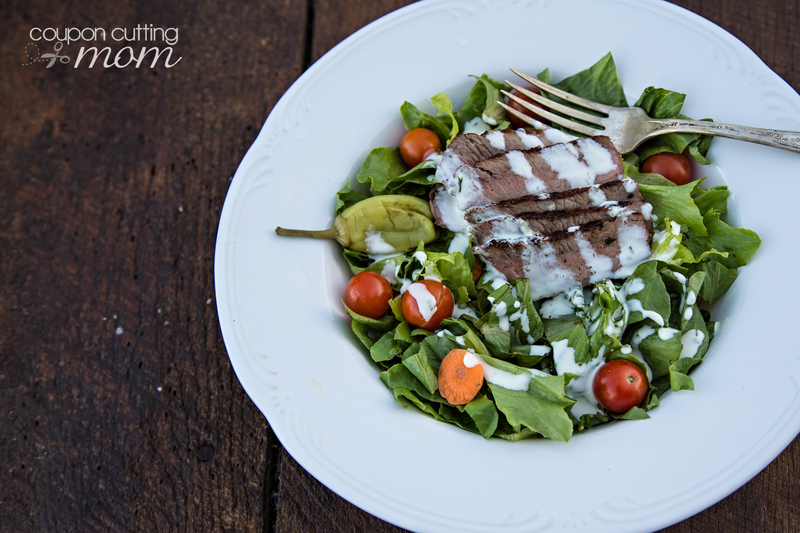 Honestly it probably takes me less time to make this yummy Classic Ranch Steak Salad than it did to tell you about it! 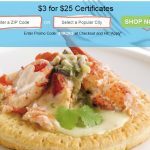 You’ll love trying this recipe out with your family, I’m sure! 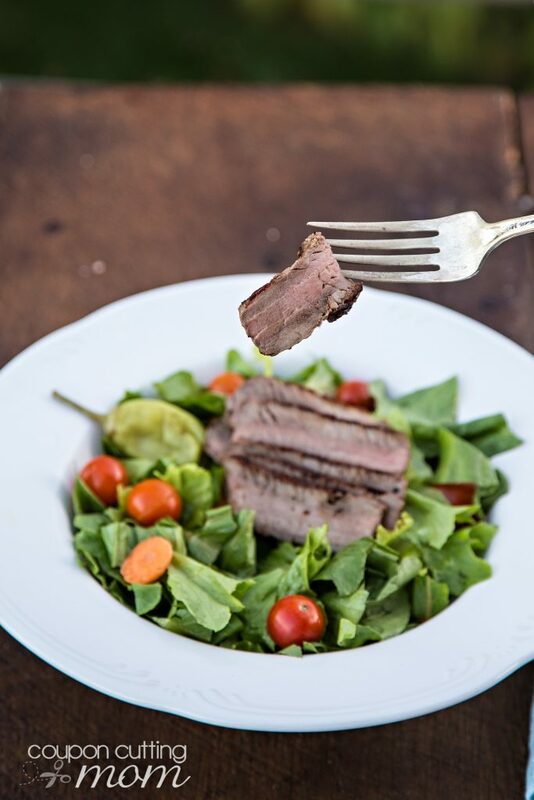 I know part of the delicious flavor in my steak salad recipe comes from the fact that I’m using Moyer Beef, fresh and local beef I can get right at my local grocery store! Moyer Beef understands family really matters; that’s why they’re committed to supporting local farmers who’ve dedicated their lives to raising quality beef generation after generation. Moyer Beef is sourced from small family farms located throughout the Northeast. So, when my family is enjoying their delicious steak salad, we’re helping another family somewhere nearby! 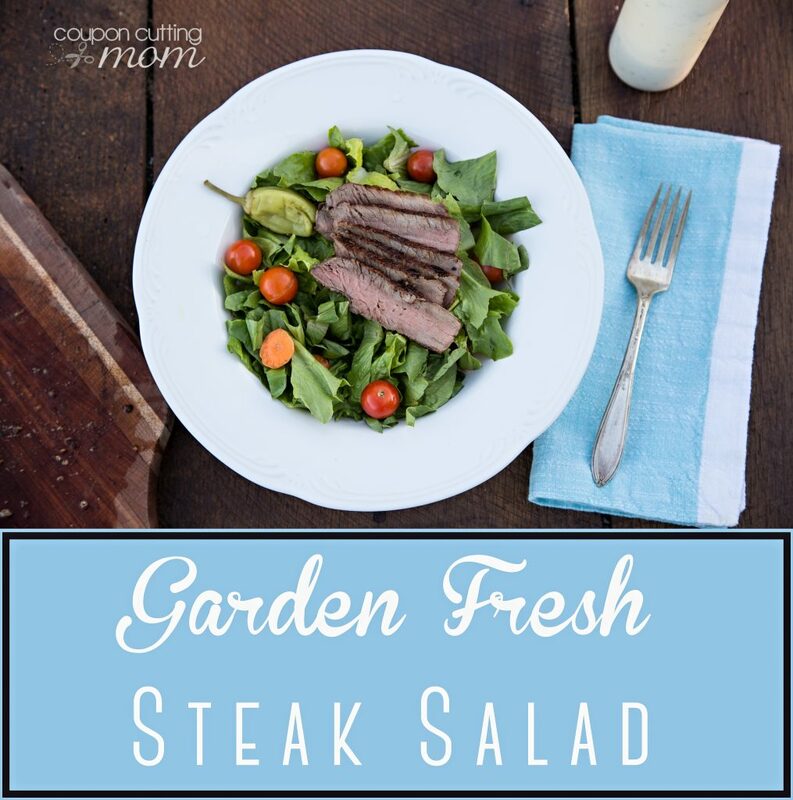 I often make this Classic Ranch Steak Salad that comes together in minutes and makes the perfect grilled lunch or dinner. 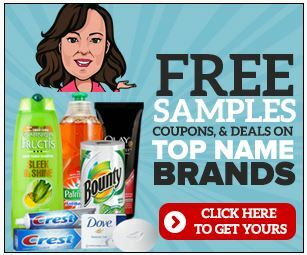 The ranch dressing is my own homemade recipe too, so it all combines for a salad the whole family loves. Grill steak directly over medium heat for 17 to 21 minutes or until steak is medium (160 degrees F) turning steak once. Let the steak rest and slice into thin strips. For dressing whisk together all ingredients. I find the Vitamix or blender is perfect for mixing the dressing ingredients. 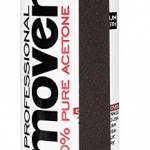 Just add everything and blend until smooth. Pour dressing into a jar and chill in the refrigerator until ready to serve. This dressing will keep nicely in the refrigerator for up to a week. Toss together greens and other veggies of your choice and then top with your steak. Drizzle with the ranch dressing and enjoy!